Monday’s market opening in New York offered mainly shades of red as the dominant color for price tickers in precious metals. Gold was the stand-out counter-mover as it received a debt jitters-induced, $8.00 per ounce lift, that brought it up to the $1,552.00 spot-bid level right out of the session’s starting gate this morning. Subsequently, the yellow metal climbed $12 right up to the pivotal $1,558.00 EW resistance point, the overcoming of which might tip the tilt into bullish posturing. Silver, platinum, and palladium all slipped lower however, right along with a sizeable sell-off in copper and crude oil. Silver dropped 7 cents to start at $36.64 per ounce while platinum was down $1 at $1,734.00 and palladium declined $10 to open at $766.00. Rhodium was unchanged at $1,975.00 per troy ounce, still some $50 better than last week’s lows. In the background, the price of a barrel of black gold fell to $94.65 while copper lost 1.61% to trade at $4.32 at last check. By the 11:00 o’clock hour however, just ahead of Mr. Obama’s appearance before the aforementioned media microphones, conditions in gold turned far less enthusiastic than they had been this early morning, and the yellow metal was showing a loss of $1 per ounce ($1,542). Meanwhile, silver fell hard and fast as well, losing 121 (3.3%) cents to slide back to $35.50 the ounce. Platinum and palladium were showing double-digit losses ($14 and $12) at that time as well. In the background, the US dollar advanced even further, rising to 76.15 on the index- a gain of .084 (1.12%) while the Dow sank 170 points in a broad-based sell-off by investors. Traders pointed to possible "just-in-case" tempering of positions in case Mr. Obama had good news to relay, and/or the possibility that the caving stock market might trigger margin call-related sales later in the week. The latest in data from the CFTC indicates that net speculative length in gold contracts fell once again last week; albeit less sharply than it did in the prior week. Nearly 24 tonnes of longs’ worth of positions evaporated last week despite a 4% weekly gain in the yellow metal. 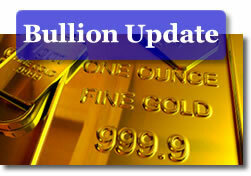 Analysts at Standard Bank (SA) caution that they are "beware of the build-up of speculative short positions [in gold]." Silver’s short positions declined to 754.7 tonnes and it appears to point to the fact that (also in Standard Bank’s opinion) players are possibly "ignoring the market’s bearish attitude." As for the players’ positioning in platinum, SB notes that a further, modest increase in short platinum positions last week "shows a speculative market decidedly bearish on Pt, which leaves the metal vulnerable." The same however cannot be said about palladium; its long positioning remains robust and is underscoring the fact that "investors are more confident about Pd’s prospects than those of platinum." Italy had, until now, been considered one of the relatively "safe" peripheral "PIIGlets" and the sheer size of its government debt (the third largest globally after Japan and the US) had equated with the perception that it was just simply "TBTF" (too big to fail). Well, so much for that particular take on matters. The euro took a painful slap on the chin this morning in the wake of estimates that the EU’s bailout water bucket may need to be twice as large (1.5 trillion) in order to contain enough liquid (all puns intended) to put out the fire that has now spread to the boot that is "Il Bel Paese." As the euro dipped, the US dollar (along with gold) gained strength. The greenback surged by 0.61 on the trade-weighted index as, despite on-going budget wrestling matches in DC, the number of alternatives for ‘safe-haven’ money to take refuge in dwindled to a…precious few this morning. As a matter of fact, despite the incessant calls from the US dollar morticians’ camp that the currency is about to meet its maker any day now, it turns out that it might just be the greenback’s year-long 13% slide that may have just come to an end. The market’s most accurate currency forecasting teams –led by the one at Schneider Foreign Exchange Ltd.- have concluded that the US currency will likely rebound to the $1.40/$1.41 by year-end. More importantly (take note, dollar-demise-deputies) the world of hedge funds and large currency speculators is "no longer betting on the dollar to collapse." That said, there are still some (Societe Generale, for one) who are holding out for a $1.50/1.52 dollar-euro by year-end. The dollar bears predicate their predictions on a Fed that will not/cannot raise rates and on a breakdown of budget ceiling talks (or worse). To be sure, SocGen’s bears have competition from another French team (the one at Credit Agricole) which envisions a dollar as strong as $1.30 against the euro by the time 2012 rolls around. As regards potential dollar damage from an un-lifted US debt ceiling, the new head of the IMF, Christine Lagarde, warned that a failure to address the lifting of same by US lawmakers could have "real nasty consequences" for America’s and the world’s economy as well. Ms. Lagarde urged the warring parties in Washington to get their act together and do that which needs to be done to avert such deleterious outcomes. Meanwhile, over in China, there is a rising school of thought that now believes that, following the rise to 6.4% in June, the country’s inflation spiral may have peaked. The yuan did lose ground against the US dollar in the wake of weekend data that revealed the three-year record high for Chinese CPI. Local currency traders now no longer expect a faster rate of yuan appreciation for the second half of this year. The PBOC is certainly not expected to relax its vigilant stance on the monetary front even if overt and frequent rate hikes are not necessarily going to be the order of the day. Pundits peg late November as the only likely time for the Chinese central bank to step off the policy tightening pedal, if then. In The Lead – Welcome! You’ve Got Bail (or not)!